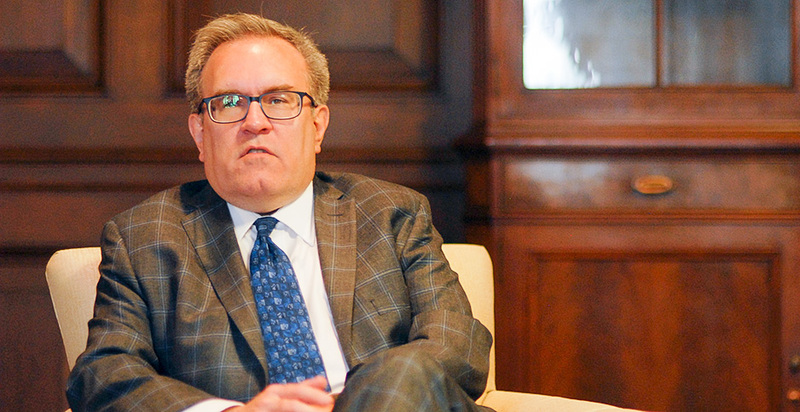 Acting EPA Administrator Andrew Wheeler sat down with E&E News for an interview at the end of his first week on the job. Since taking charge of the agency after Scott Pruitt's resignation, Wheeler has been taking calls from lawmakers and meeting with EPA staff. He's already made subtle changes to how the agency operates, from posting online his daily calendar to opening up a hallway leading to his office that his predecessor once kept closed. Pruitt's agenda of regulatory rollbacks will likely remain at EPA under Wheeler's watch. The acting chief, however, has no plans to revive a "blue team, red team" debate exercise on climate science, which Pruitt once heralded. He also wouldn't delve into "parsing the numbers" on how much humans contribute to climate change. Wheeler, who was with lobby firm Faegre Baker Daniels Consulting before joining the agency this April as deputy administrator, is also trying to ensure he avoids conflicts of interest with his past lobbying work and said he wouldn't meet with his most famous former client, coal giant Murray Energy Corp., as well as others. He did note he had lobbied on EPA issues in the past, although he couldn't say when exactly, and called himself a former "energy and environment lobbyist." Wheeler also described how he would manage the agency, saying he values the staff's work and wants to maintain EPA's technical expertise. He also touched on his personal security — one of Pruitt's hallmarks at EPA — saying his protective detail has the appropriate level of security and it would be "expensive" to tear down the secure phone booth installed in the administrator's office, which he hasn't used yet. Below is a lightly edited transcript of E&E News' interview with Wheeler. How is your first week going? I think it's gone all right. It's been a little crazy. ... I had a full calendar for the next couple weeks, and Administrator Pruitt had a full calendar, and so we tried to combine the calendars, and then plus there's a lot of additional things that I needed to do this week, like the all hands meeting Wednesday. And I've talked to probably a dozen congressmen and senators that wasn't on either one of our calendars, so it's been triage on the calendar side. At Wednesday's meeting, the career staffers here were excited that the hallway outside the administrator's office was open. Do you intend to keep that hallway open? I intend to keep it open. I guess it was probably in one of your publications, I read an anonymous EPA employee complaining about that a few weeks ago in an article, saying how they used to walk through it all the time and if they had outside visitors, they would show them the hallway. I was going to talk to Administrator Pruitt about it, but then when I took over, I just went ahead and opened it up, because it should be open. Employees should be able to walk through there. Is that part of a broader transparency push on your part, or was it as simple as opening the doors to a hallway? To me, it was as simple as opening the doors to the hallway. ... But I think that kind of goes to my underlying transparency, my own personality there. You have said you believed in climate change. Do you think that human emissions are the driving factor there? I think human emissions contribute to climate change. I'm not going to put a number. If you say the driving factor, then that's assuming it's a certain number. ... I'm not going to get into the parsing the numbers. Are you going to pursue plans for a "red team" climate debate? I don't believe Administrator Pruitt was pursuing that any longer, either. In fact, he and I didn't discuss that since I've been here, but I don't see the point of it at this point in time. We're moving forward on replacement for the [Clean Power Plan], we've sent a proposal over to [the White House Office of Management and Budget], so we're moving forward on that front, and I think it's more important to focus on the regulatory side. On the Clean Power Plan replacement, I wonder if you can speak very broadly on the parameters of what you'd like to do. I want to follow the Clean Air Act. I don't think the Obama proposal or regulation followed the Clean Air Act. I think that's why the Supreme Court took the unprecedented move to issue the stay, so we're sticking within the four corners of the statute. On the policy barring active EPA grant recipients from serving on the EPA advisory committees, do you plan to continue that? I do. I haven't really looked at that, but fundamentally, I believe we've been meaning to make sure that people who serve on those boards don't have a conflict of interest. It's my understanding that's what that policy was trying to get to, making sure that you don't have somebody on the advisory board recommending that the EPA go down a path where they're already doing their research and getting money from the EPA. I am very careful on conflict of interest, which is why I did not seek any waivers at all for any of my lobbying conflicts. I have recusals in place, and I did not seek any waivers. I said during my confirmation process I did not anticipate seeking any waivers. I haven't, and I still don't anticipate any waivers being necessary. I want to make sure I don't have any conflicts of interest, and I think the people who serve on our science boards shouldn't have a conflict of interest. Since you did lobby for the coal industry, how do you ensure that there aren't conflicts of interest there given that there's so much that you do that deals with coal? I did not lobby the EPA on behalf of my coal client for — our press guys were actually asking me last week how long has it been. I'm not even sure how long it's been. It's been a minimum three or four years. I don't remember the last time I lobbied EPA on behalf of a coal issue. And it's been, the last coal issue, the EPA coal issue that I lobbied Congress was to support the [Congressional Review Act] on the Clean Power Plan, and that was outside the two-year look-back that the ethics officials take into consideration. But I haven't lobbied at all for almost a year now. But as I said in my speech Wednesday, the No. 1 issue I lobbied on behalf of the coal company in the last four or five years was the Miners Protection Act, which was to shore up the pensions and the health care benefits for the coal miners. I lobbied a Department of Interior issue for the coal industry, for the coal company. But I've gone through all of this with our career ethics people, and they don't see any conflicts. I will not meet with my former client, and I am not meeting with my former law firm. I'm not meeting with any of my former clients that I've worked on over the last two years. You were referring to Bob Murray of Murray Energy? Bob Murray, Murray Energy, but my other clients as well. I'm not meeting with any of my former clients, and I'm not meeting with anyone from my law firm. Do you remember the last time you did lobby EPA and what it was about? My last meeting at the EPA was not a lobbying meeting. It was on behalf of a company that just wanted more information about one of the programs. So that wasn't lobbying. I honestly don't remember. It could have been on behalf of South Coast Air Quality Management District because I did come in and meet with Gina McCarthy with them, but that was when she was assistant administrator for air. I lobbied some EPA issues. I did lobby the Department of Interior, and I lobbied at [the White House Office of Information and Regulatory Affairs], but at OIRA, those were Interior or Department of Labor issues. I don't even remember the last time that I lobbied an EPA issue with the administration. Do you intend to follow through with the "secret science" policy that would require that EPA only rely on studies for rulemaking where the data has been made public? That was proposed before I got here. I'm going to take a hard look at it. But I cut my teeth at the agency working on the Community Right-to-Know Act, and I really fundamentally believe the more information we put out to the public as far as what we're basing our regulations on, the better our regulations will be. I think it's important to get all that information out. At the same time, there's HIPAA requirements to make sure that you're not disclosing personal information about individuals involved in studies, and I want to make sure we safeguard that, but other agencies do that. FDA publishes the information they use as the basis for their regulations. Yes, I want to move forward with that. I don't know if the final is going to look exactly like the proposal. We're receiving comments, the comment period is still open and we can't prejudge any of that. But fundamentally, I do believe that the more information you put out to the public, the better the regulatory decisions will be and the better understood the regulatory decisions will be by the public. What would you say to EPA scientists who have felt concerned under this administration about their work perhaps being censored or not being valued by agency leadership? I'm telling them every day that I value their work. When I went down to [Research Triangle Park] I spent a day down there. This was my first visit off the main campus. I did that on purpose, and I met with a lot of the researchers and I'm excited about the work that they're doing. A day after I got back, I met with my counterpart from Canada [the deputy minister of environment and climate change], and I invited him to go back to RTP with me, I said you really ought to see what our scientists are doing down there. On the renewable fuel standard, how do you balance the priorities of farmers and the oil and gas sector? Our responsibility is to follow the letter of the law. The balancing between the two is done in crafting the legislation and any changes to the program, fundamental changes have to be done legislatively. We're going to follow both the letter and the spirit of the RFS program. There are issues, I would love to see more stability in the [renewable identification number] market, but we want to make sure that the one thing this administration has done and Administrator Pruitt and our team and Bill Wehrum over in the air office have done is gotten the [renewable volume obligation] numbers out in time. The previous administration, I think, was two years behind at one point. So we're committed to doing that and that brings a lot of stability to the marketplace and that's what we want to provide on the RFS program: stability. There was a round of buyouts last year, and the Trump administration and the Trump White House has proposed budget cuts for EPA. How much do you think EPA needs to be downsized and where? My biggest concern on the EPA personnel side is taking a look at the people who are eligible to retire. I think about almost a third of our workforce is eligible to retire over the next five years. My concern is to make sure that we have — that we maintain — the technical expertise that we need and that we recruit people to step in with the right technical expertise so that we don't have any gaps or holes in the EPA personnel. So that's my biggest issue, and that's how I'm looking at the personnel side. Our acting Deputy Administrator Henry Darwin, who's working a lot on the management side, is looking into these. He and I have sat down and talked about the issue and the problem with so many retirees coming up. We do not have a full-time human resource director, a permanent human-resource director. We are recruiting for that. Henry and I and the chief of staff sat down with the chief of staff at [the Office of Personnel Management] about three or four weeks ago to try to get some additional help on the recruiting side because we really need to have somebody in here who can take a hard look at what our needs are and to make sure that we're looking out. I want to make sure that we don't have huge gaps five years from today. Do you think EPA should be eliminated and its authority delegated to the states? Do I think that EPA should be eliminated? No. Do you consider yourself to be an environmentalist? I've always considered myself to be an environmentalist. I'm an Eagle Scout. I go hiking, I go camping, I've always done that. My favorite job I've ever had in my life was being the nature conservation director at a Boy Scout summer camp when I was in college in Ohio. The camp was right outside of Dayton, Ohio. I'm reserving judgment on this job to see if this will be my new favorite. But so far that was my favorite, although it only paid $1,000 for the entire summer. Actually I think the third summer I did it was $1,500. ... I did it three summers when I was in college. ... It included the tent and the mess hall, if you can call that room and board. It was fun. The most fun I've had at a job. Do you have a 24/7 personal security detail? I have the appropriate level of security that the security detail says I need at this point. And if I go into too much detail, if I publicize that I don't have 24/7, then that could create a security issue. ... I would think if I announce to the world that I don't have 24/7, then people might start showing up in the middle of the night. Have you used the secure phone booth? Have I used it? No, I have not used it yet. What are your plans for it? Do you have any plans for it yet? Have you given it any thought? It's there. It would be expensive to tear it apart, I don't see any sense in tearing it apart. And in this day and age, I don't know what the assessment was for the need of it. I did look into the cost of the booth after I got here. Administrator Pruitt asked me to look over the expenses for his office and in doing that I decided the best way would be to pick a case study and take a look at it to see how the decisions were made. So I looked at how the decisions were made on the spending for the booth. When the cost of the security detail came out recently, there was a commitment to release the cost figures for payroll and travel expenses for the administrator's security detail every quarter. Do you want to keep that policy disclosing those figures going forward every quarter? I'd have to talk to the security detail to see if that's a security issue. I don't know and I didn't realize that commitment had been made. Administrator Pruitt issued a memo that basically top officials would sign off on any expenses of $5,000 or more, including you as deputy administrator at the time. Are you going to keep that process in place? Yes, I am keeping that in place and the acting deputy, Henry Darwin, and the CFO [chief financial officer] and the chief of staff. Two of the three of them will sign off on any expenses over $5,000. Senior career employees who worked in the administrator's office were demoted or reassigned after reportedly raising questions about spending decisions made by the office. Do you plan to review those personnel decisions at all? I have not taken a look at those issues. I know several of those people are no longer here. Generally, there have been claims of retaliation against whistleblowers. If there's any active investigations along those lines, I'd have to defer to those investigations and what may come out of those, and I can't prejudge something like that. ... But I take accusations of retaliation very seriously, and I would want a full investigation of those. Can you talk about your long-term career goals? Do you have any plans to run for office? Political aspirations? No, I do not have any political aspirations. I haven't thought beyond being acting administrator. No, I have no political aspirations at all. What don't we know about you yet? We know you've been a coal lobbyist. What else should we know about you? You know I've been an energy and environment lobbyist. I do not have any pets. I'm allergic to cats and dogs. I love dogs. I enjoy camping and hiking. I'm going hiking tomorrow with a couple of friends. I like being outdoors. I love traveling. I enjoy cooking, including baking. I've baked a few cakes since I've been here for staff. Can we see the secure phone booth? It is in a storage closet, and it does not look that impressive. It looks like a phone booth. I've not used it yet.